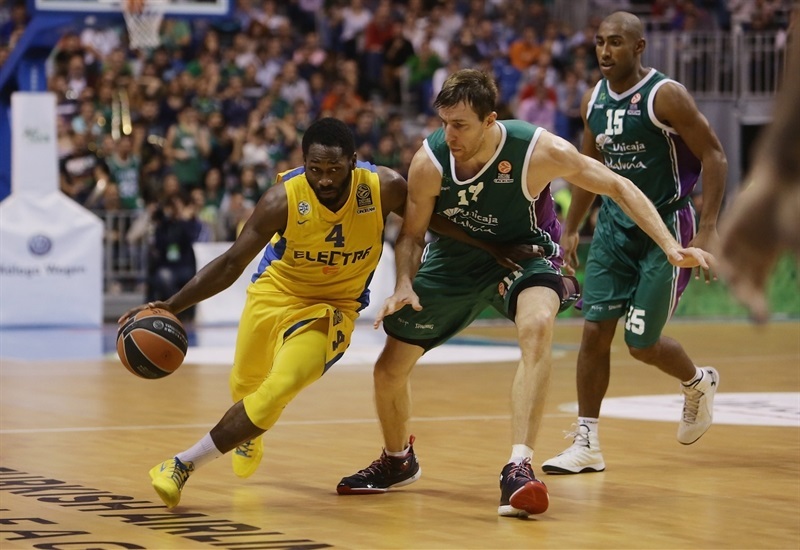 It was a complete thriller on Thursday night in Spain as reigning champs Maccabi Electra Tel Aviv pulled a tough road win at Unicaja Malaga by 66-70. Maccabi started controlling the game, but little by little, Unicaja regrouped and managed to complete the comeback, 58-57, despite a very poor start from the arc. 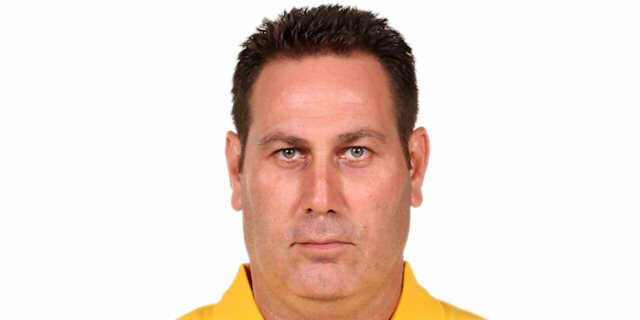 However, in the final minutes, two technical fouls for the hosts, including a second for coach Joan Plaza, who ended up ejected from the game, allowed Maccabi to get some air and secure the win from the charity line. 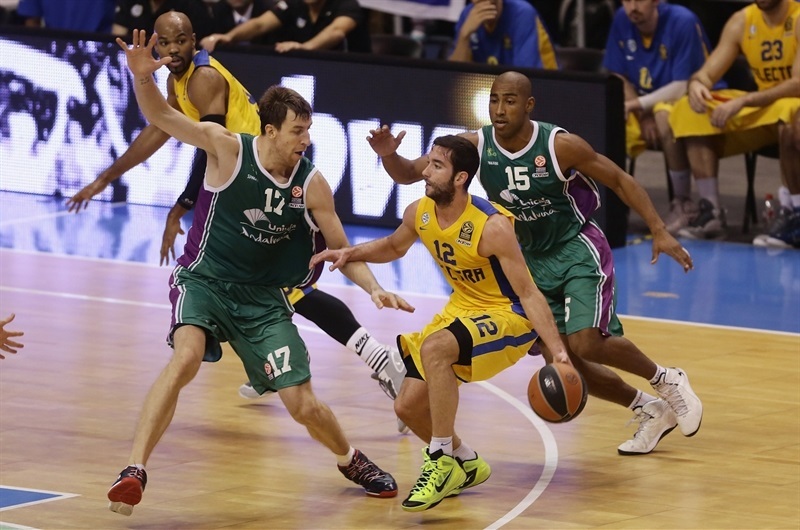 The win allows Maccabi to improve to 3-2 in Group B, while Unicaja drops to also 3-2 after losing two straight games. Devin Smith topped all scorers with his double-double of 24 points plus 10 rebounds, and Brian Randle added 12. For Unicaja, who started the game with a 2 of 18 from the arc and ended with a 6 of 28, Ryan Toolson and Will Thomas netted 16 points apiece. The game started looking good for Maccabi, as the guests were soon up by 0-8, powered by Brian Randle's four points. On the other side, Unicaja was struggling with 0 of 4 from the arc until Kostas Vasileiadis get the hosts going with his own three, 3-10. 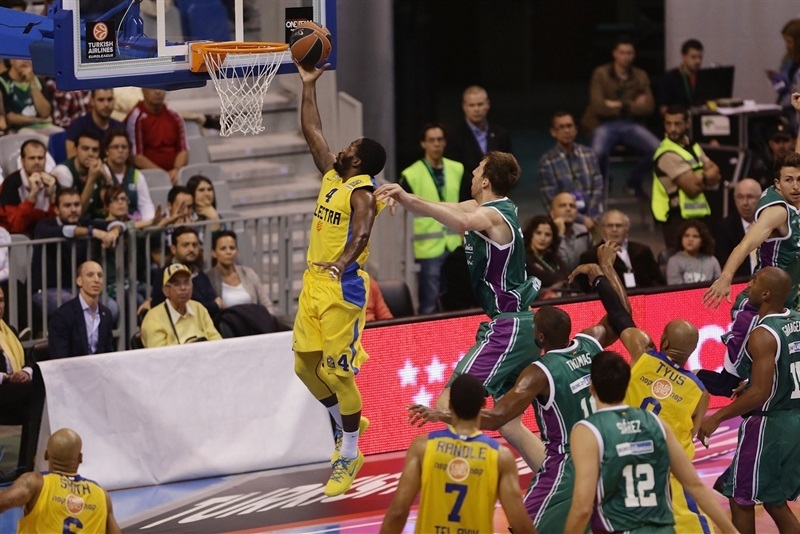 Randle was up to six points soon, as Maccabi was finding easy baskets despite the defensive efforts of Unicaja. Jeremy Pargo managed to launch the guests with power bursts for easy buckets to make it 7-16, as Unicaja barely stayed alive thanks to free-throw points. Marquez Haynes made it a 10-point game with his layup for 8-18, while Will Thomas replied with Unicaja's first field goal in almost four minutes. 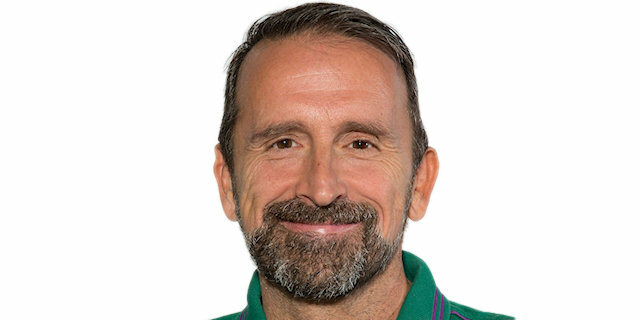 Carlos Suarez stepped on court for his first minutes of the season as Unicaja managed to pull within 12-18, but after 10 minutes it was the reigning champs dominating, 13-21. Devin smith put a start to the quarter with a baseline dunk but Fran Vazquez and Thomas combined with each other, both ways trading assists, in two straight plays to make it 17-23, despite a 1 of 13 from the arc by Unicaja. Maccabi was finding a green wall in offense now, and struggled to score while Unicaja seemed to be finding its rhythm in offense minute after minute. Also, the hosts were improving in the offensive rebounds department, allowing for second options, but Maccabi still managed to keep the edge to the game, 21-27 in minute 15. When Pargo fed Alex Tyus for an alley-oop and later, Randle ran an uncontested layup due to lack of defensive balance by Unicaja, it looked like the game was back on the same path, 23-31. However, Unicaja never gave up and Mindaugas Timinskas hit an acrobatic layup in the lane and then Caleb Green closed the quarter with a long jumper for a 29-35 Maccabi lead at the break. The second half started with Maccabi in control again as coach Joan Plaza and Pargo were called on respective technical fouls. Smith pulled up from the arc and hit a three for the guests' largest margin yet, 32-45. Ryan Toolson finally nailed Unicaja's second three after 18 attempts, and later he added a free throw to bring the game back to single digits, 36-45. 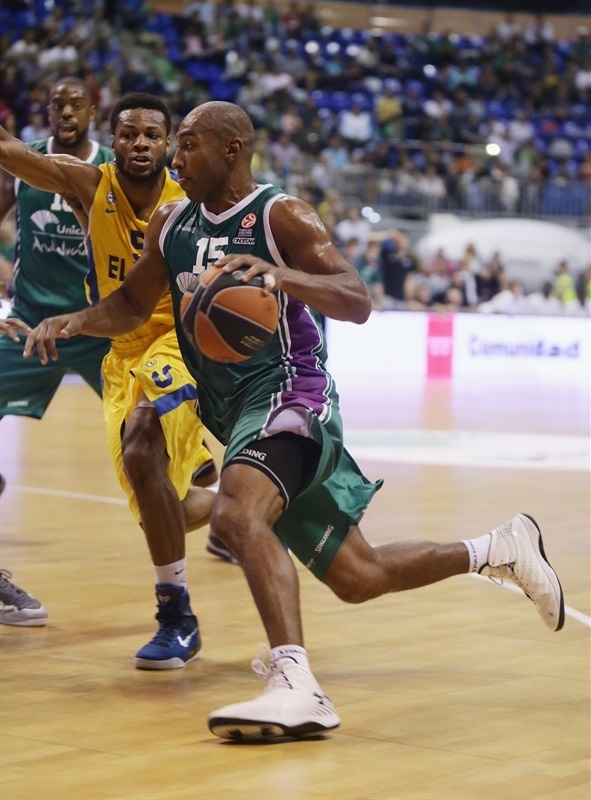 It was then time for the three-point shoot-out as Haynes and Smith blasted a couple for Maccabi but Granger and Green did the same, at last, for Unicaja as the score quickly progressed to 43-53. 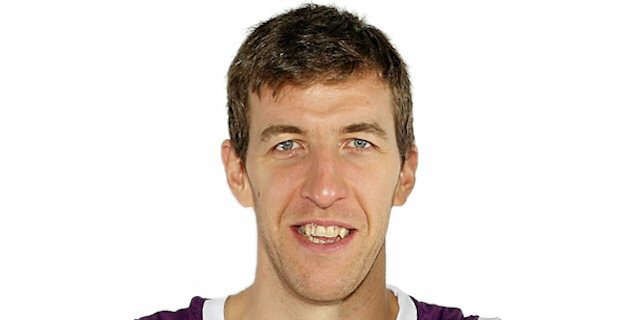 Unicaja's defense tightened up and when Thomas put back the ball to make it a 6-point game and soon Stefan Markovic fed Thomas for the alley-oop that made it 50-54 as the crowd stood up on the stands and the game reached the end of the third period. 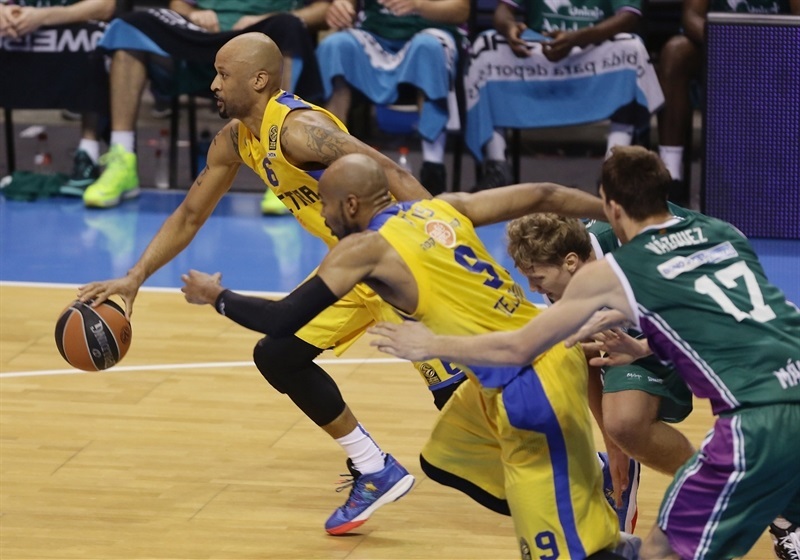 Smith kept shooting away from the arc and opened the decisive quarter with another three, but Unicaja's hustle in defense was now forcing Maccabi to mistakes. The problem was that the hosts were not finalizing the offensive actions on the other end, and the clock kept ticking with a 52-57. More than three minutes went by without points while Randle had to leave the court injured for the guests. A new game was beginning. 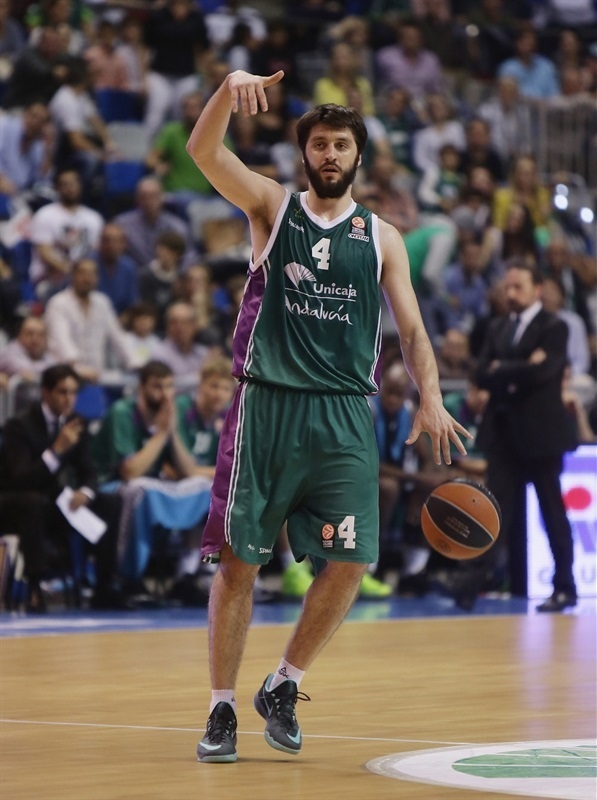 Finally, Markovic finalized a Unicaja transition after great defense with a layup for 54-57 and 5 minutes to go. Suarez hit once from the stripe after a double offensive board to make it a two-point game, and when Toolson blasted a three for a Unicaja lead, 58-57, the Martin Carpena Arena exploded. 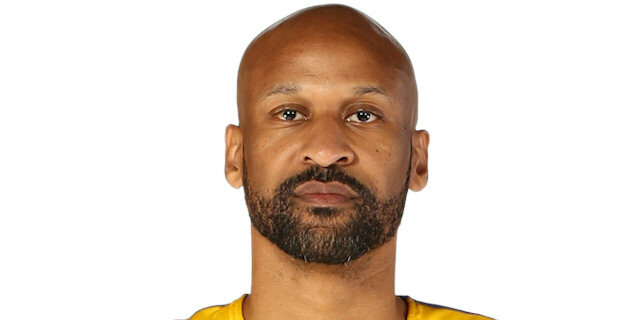 Alex Tyus soon restored order on Maccabi's part, but a new tecnical foul was called on Vasileiadis and as a result, another on coach Plaza that had him ejected from the game. Maccabi went up to 58-61 and Unicaja was letting the game go allowing Maccabi for many offensive boards until Smith finalized for 58-63. Randle managed to get back on the court and the game entered the last 90 seconds with Vasileiadis' free throws for 63-66. 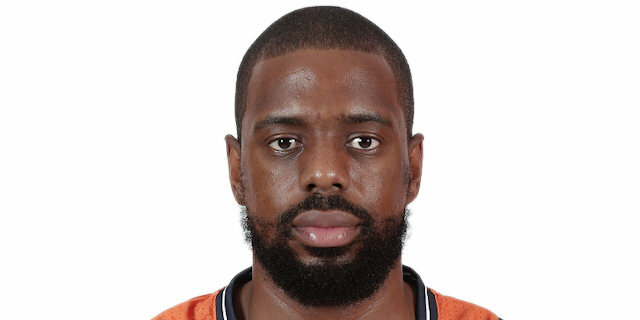 Pargo kept its cool and found the right time to feed Alex Tyus for a slam dunk that seemed to seal the deal, 63-68, with 45 seconds to go. Granger looked for the rim but he was blocked, and on the other side Unicaja fouled the worst man they could as Smith added a new point from the stripe, 63-69. Vasileiadis looked for the three and found it with 15 seconds to go for 66-69 and Smith, again, hit one from the stripe to close the game, 66-70. "Although we competed the game, we are upset, especially with the first quarter. We lost only one quarter and at the end we lost the game, but that's basketball. They have made a lot of defensive changes and we have not been calm to attack well. The defeat is marked by the percentage in the two-point shot. They have competed well. They did a lot of zone defense and if you're not successful, it's complicated. They play with a lot of verticality, with five players open many times. 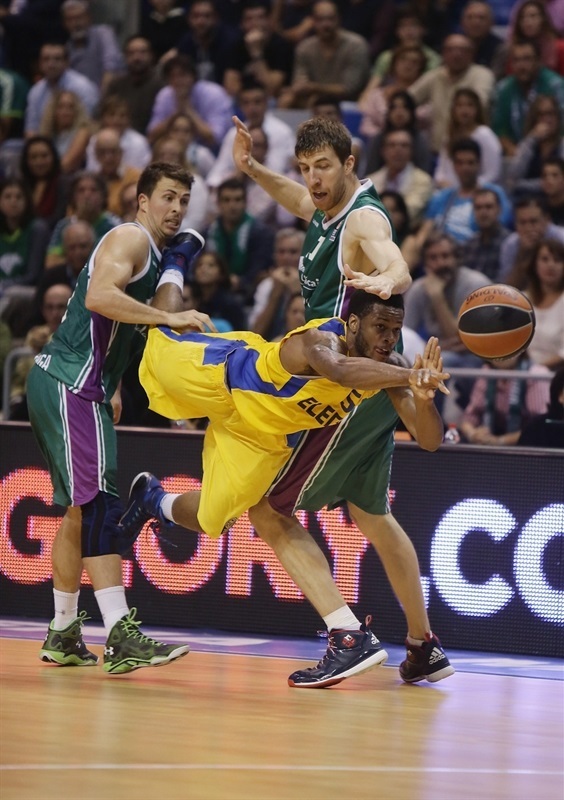 Leaving Maccabi at 70 points is not bad defense. We have to see what things we have done wrong in the game, the team and myself. I think if we had done our job well, we would have had more chances to win. I think with two minutes more we would have won the game. My assistants are well prepared. I thank the fans who came today. They have encouraged us so much." "It's a great win for us. We talked with our guys before the game and the situation we were going through. We knew we were coming to a difficult arena in Malaga. I think we showed big character and we did a wonderful job, especially in defense. We wanted to keep Unicaja under 70 points and we did so by allowing them 66. Congratulations to all the group." "It was a tough game. We fought all game to have chances of winning at the end. It was a shame to lose a game on this way. I thank fans for their support in a difficult game for us. We have to think about the next game. We have to think of the things we did wrong during the game. The team will continue to train hard to get better every day." "We fought hard and had options to win but couldn't do it. The team played with heart and gave everything it had. We have won in difficult courts and our two losses came against the best teams in the group, CSKA and Maccabi, two Final Four level teams. We have to keep working hard." "This win means a lot to us. We have been struggling the past two weeks and we desperately needed this because we didn't want to go down to 2-3. It was a team effort, we came together and fought hard for this win."